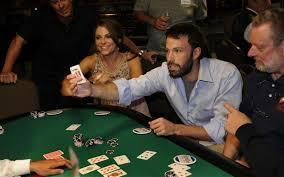 Ben Affleck Barred From Las Vegas Hard Rock Tables For Counting Cards. when in Las Vegas been Affleck has always been known for his love of the tables. But this time he has been banned from a Las Vegas casino for allegedly being caught counting cards. 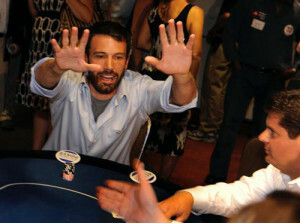 The 41-year-old actor was at the high roller table at the hard rock casino in Las Vegas, close to the Las Vegas strip. On Tuesday he was confronted allegedly counting cards. Staff are said to have accused him of these tactics because he was playing “too good”, which is not illegal but it is grounds for being banned. sources state that athletic “uses perfect basic”, an industry term for card counting, “but also takes insurance according to the account.” They also added, “uses black $100 cheques to keep tract of the account while playing.” radar reports that an alert was sent out to all surrounding casinos in Las Vegas the following day declaring that Affleck was “currently suspected of advantage play.” The alleged ban comes again after Affleck was previously warned on April 22 after he was suspected of using a similar strategy.